The North Carolina Military Institute, a state-supported military school, opened in Charlotte in 1859. North Carolina by that time had established itself as a leader in private military education, which became popular throughout the South. After Virginia, South Carolina, and other southern states subsequently experimented with publicly supported military schools, North Carolina followed suit. Due to the efforts of future Confederate general Daniel H. Hill, the cornerstone for the institute was laid in 1858. The school received a charter from the state legislature in 1859 and opened its doors that fall with 40 cadets. The first instructors included Hill and future Confederate generals James H. Lane and Charles C. Lee. Within a year the school had more than 100 cadets, and that number had grown to 150 by April 1861. 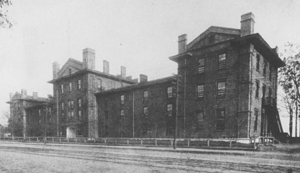 The coming of the Civil War closed the institute in 1861. Governor John W. Ellis ordered the entire corps of cadets to duty as drillmasters in Raleigh, and many later served in the 1st North Carolina under Hill, their former superintendent. The school was revived briefly in 1873 by Col. John P. Thomas, later superintendent of The Citadel. After a few years, it functioned as a graded school only. John Hope Franklin, The Militant South, 1860-1861 (1956). Edgar W. Knight Jr., A Documentary History of Education in the South before 1860, vol. 4 (1952). Steward's Hall, home of the North Carolina Military Institute. Image courtesy of Charlotte-Mecklenburg Historic Landmarks Commission. Available from http://www.cmhpf.org/ (accessed November 7, 2012). 1 January 2006 | Andrew, Rod, Jr.
Col. John Peyre Thomas left the school when offered to reopen the Citadel in 1886. He was an alum of the Citadel. He previously was the superintendent of the Arsenal (now the SC Gov mansion) which was part of the State Corps of Cadets for the first year where attended before going to the Citadel. Thomas is my great great great grandfather through my mother's mother. I can provide documentation if you wish to add this to the narrative above.